WBA “regular” welterweight champion Manny Pacquiao is looking to face the best opponents possible in the remaining years of his pro career. Last year, Pacquiao aligned himself with powerful adviser and the Premier Boxing Champions, Al Haymon. 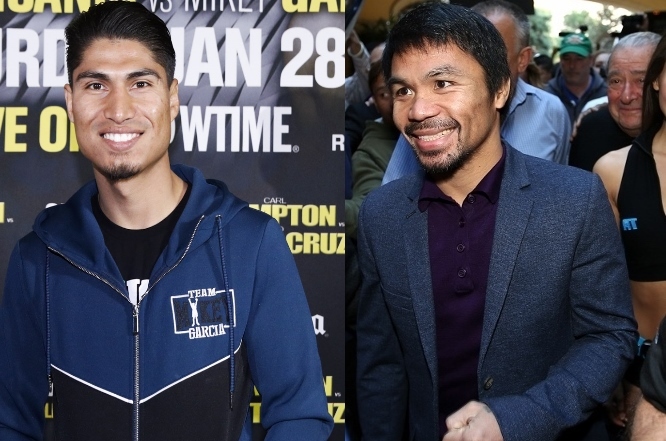 Haymon promotes numerous welterweights who could face Pacquiao – like Keith Thurman, Danny Garcia, Errol Spence, Shawn Porter, Adrien Broner, and several others. Another possible opponent, who works closely with Haymon, is former four division world champion Mikey Garcia. Garcia is currently the WBC lightweight champion, but he’s moving up to the welterweight limit of 147 to challenge Spence for the IBF title in March. Garcia is a tremendous underdog in the contest. Win or lose, he can still be a strong opponent for Pacquiao down the line. For his part, Pacquiao is defending his belt against Broner, a four division champion, on January 19th at the MGM Grand in Las Vegas. In the past, there has been some discussion about doing a possible Pacquiao vs. Garcia encounter – but it was a difficult fight to make due to politics. During that period, Pacquiao was promoted by Top Rank – who Garcia had past issues with. Garcia was promoted for most of his career by Top Rank, but he eventually made his move to break away from the company. Garcia’s fight for freedom generated a bitter legal battle that lasted for several years before both sides reached a settlement agreement. Now with the political issues pushed to the side, and both fighting under the PBC banner, Pacquiao believes the contest can be made. “We have many strong opponents for the future, including Mikey Garcia, now that we are under the same promoter. I think it would be more feasible to make now and he would bring a good fight,” Pacquiao said to Bein Sports.